Mens mediaeval costumes tend to be loose fitting on the top half and more fitted on the bottom half therefore when ordering we only require waist size information. 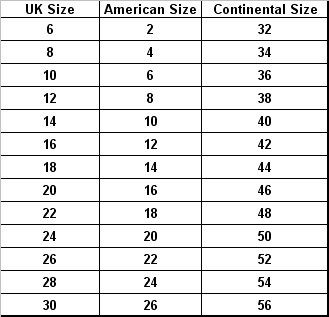 With the majority of our costumes we can mix and match the top and bottom half of the costume so if your waist or chest size differ from the matrix shown below it does not necessarily mean we are unable to supply the costume you have chosen. Additionally it is advisable to wear black shoes with all of our costumes as the majority are supplied with a black over boot. This in effect is a soleless knee length boot that has two pieces of elastic in place of the sole that can then be worn over your own shoes. Hence shoe size is not required. None of our mens costumes come with pockets so we offer a black leather draw string pouch which can be worn around the neck and comfortably accomodate a wallet, mobile and keys. These can be rented at only £3.50 each. Q: Do your costumes come up small or big? A: Our ladies mediaeval range on the whole tends to be more generous as a lot of the fabrics used have a level of elasticity to them. Q: Does this mean I could get away with ordering a smaller size? Q: What does it mean when the size says for example 12-14? A: It means that the costume is a generous size 12 to a small 14. Q: What about the length of the costume? Q: Can you adjust the length of the hems to make them shorter or longer? A: In most cases yes however if there is insufficient hem available to let down we may recommend an alternative or suggest putting an under skirt with the costume. Likewise if the hem is too long providing we have sufficient notice we can take it up. Q: Is there an additonal charge for providing an under skirt or taking up or letting down a hem? A: Yes the additional charge of providing an under skirt is £5 whilst hem alterations are charged at £10 per hour. Q: Could it take longer than an hour to take up a hem? A: Yes certain dresses are in fact two dresses laid over the top of one another, some are also lined however we would advise you of the cost at the time of booking. The maximum charge would be £20.